Raila Odinga : Raila Odinga withdraws from the October polls as IEBC demonstrations for reforms continue. -NASA KENYA. - Bana Kenya News, Real African Network Tubanane. Home featured Nairobi Raila Odinga : Raila Odinga withdraws from the October polls as IEBC demonstrations for reforms continue. -NASA KENYA. Raila Odinga : Raila Odinga withdraws from the October polls as IEBC demonstrations for reforms continue. -NASA KENYA. 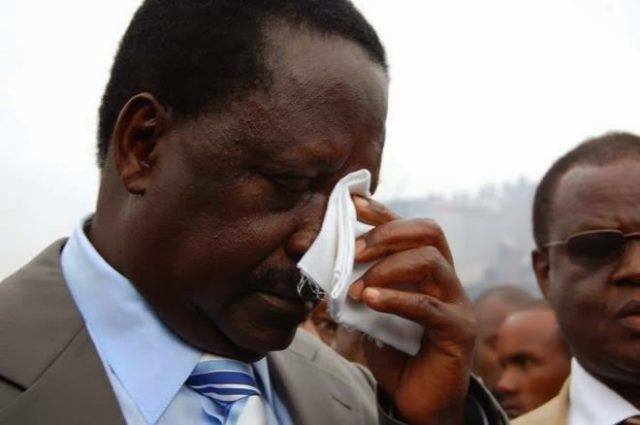 Raila Odinga resigns in the Presidential race as the president took his campaigns to Taita Taveta. Speaking at Okoa Kenya today evening, Raila Odinga expressed the way IEBC has been ignoring their reforms calls. "We had the supreme court ruling and recommendations but the IEBC has ignored everything and they are not willing to change anything." Raila Odinga stated. IEBC is converging at the Anniversary Towers to look for ways on how they will interpret the constitution as it is now clear that the Country will either go for fresh elections or Swear in President Uhuru Kenyatta as his term ends on November first. "Demonstartions will continue as planned and will demonstrate until the IEBC agrees for reforms. We will not going back until we make our country great again. We fought for constitution and we won, we fought for multiparty and we won, now we are fighting for liberation until we won." Siaya senator James Orengo said.